Eileen Battersby argues for the importance of books in translation. Cathal Coyle discovers the delights of the Seamus Heaney HomePlace. Tony Canavan marks the 200th anniversary of Frankenstein by looking at the Irish angle. Arnold Horner charts the mapping of County Laois over the centuries. John Kirkaldy discusses the Irish influence on Australian literature. Polly Young profiles a rising star on the Irish scene, Colin O’Sullivan. Joanne O’Brien explains why it’s important to highlight the peacemakers in Defending Hope. Tony Canavan spends a pleasant morning in Sandymount’s Books on the Green. Tony Canavan that you should be careful what you wish for in Oscar Wilde’s The Picture of Dorian Gray. Hugh McFadden—The Collected Letters of Flann O’Brien, edited by Maebh Long. Kevin Kiely—A History of Irish Working-Class Writing, edited by Michael Pierse. Rory Brennan—Radicalism and Reputation: the career of Bronterre O’Brien, by Michael J. Turner. Lisa Redmond—,em>Brendan O’Regan: Irish innovator, visionary & peacemaker, by Brian O’Connell and Cain O’Carroll. Liz Maguire—The Surface Breaks, by Louise O’Neill. Joseph Horgan—Rainbow People, by Nicholas Mosley. Anne O’Leary—The Lost Soul of Eamonn Magee, by Paul D. Gibson. Eoghan Smith—The Coming of the Celts, AD 1860: Celtic nationalism in Ireland and Wales, by Caoimhín de Barra. Christina Hunt Mahony—New to the Parish: stories of love, war and adventure from Ireland’s immigrants, by Sorcha Pollak. Patricia Byrne—H. Montgomery Hyde: Ulster Unionist MP, gay law reform campaigner and prodigious author, by Jeffrey Dudgeon. Isabelle Cartwright—Shift, by Mia Gallagher. Tony Flynn—Tuesdays Are Just As Bad, by Cethan Leahy. Sue Leonard tells us what she likes about books from recent début authors. Cathal Póirtéir picks his favourites from recent books as Gaeilge. Paula O’Hare raids the publishing scene for the latest crime fiction. Fred Johnston picks out his choice of newly published poetry books. 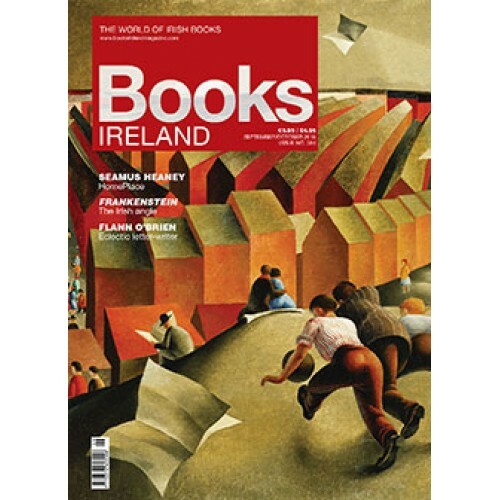 Tony Flynn catalogues all the new books that have come in since our last issue. Brendan Joseph O’Dea tells us why Joseph Sheridan Le Fanu evokes memories of Ireland.